Yesterday, a new free-e-books website relaunched. It is called 1freeebooks - The 1 source that is FREE, FAST and FREQUENTLY updated. 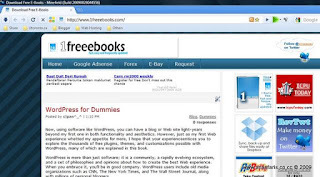 1freeebooks.com hosts files with dropbox which is known for it is easy sync storage and sharing files. At 1freeebooks.com, you can find a lot of free e-books. From the diagnostic of the sites, most people liked to download Google Adsense e-books and Forex e-books. 1freeebooks.com shares a lot of quality adsense e-books that would guide you in making money online. Other free ebooks categories are chess e-books, literature e-books, mind tweaking e-books, literature e-books, internet marketing e-books, e-bay e-books, programming e-books etc. Again, everything is free! Become a follower of 1freeebooks.com now! Grab your free ebooks for free as fast as lightning! If your desired ebooks are not in the site, feel free to request by clicking request on the navigation bar. You'll get your requested ebooks directly from your e-mail if your ebooks are available. Here is a collection of different e-books, tutorials to improve your blog or website, website designing and many more.